Hood Insulation Blanket + New Retainer clips for 1977 – 1981 Trans Am. Reduce engine heat and engine bay noise, clean up the appearance of your engine bay! FREE SHIPPING! 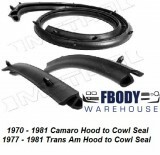 While not all Trans Am’s came stock with this option all hoods are pre-drilled for the clips so even if your car did not come with this you can add it at home in about 15 minutes. This unit is for use on Trans Am's WITH shaker hood. (AKA your hood has a hole opening for the scoop) We also have the Firebird NON scoop style, and 80-81 Turbo Hood units available as well. This set includes the blanket and also 15 of the retainer clips (also new) Everything you need for install. 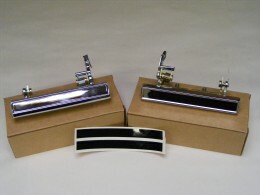 Clips are a correct reproduction of the GM units.